Israel’s archive is allowing the publication of 16 historic documents relating to the submarine’s disappearance and the subsequent search operation, but the answers are not surfacing easily. Remnants of the submarine were discovered on the Mediterranean seabed 14 years ago, “but the question as to the circumstances of the sinking remain open to this day,” according to sources at the State Archives. 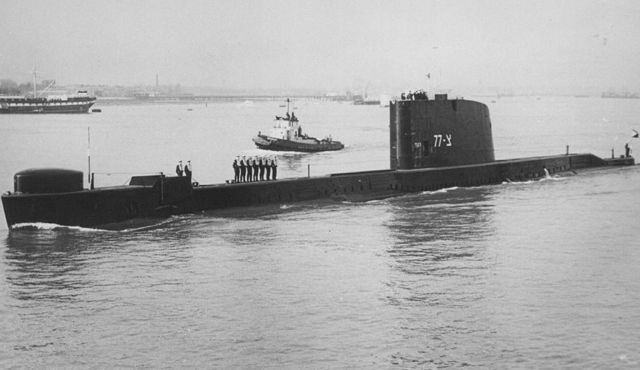 Now, almost exactly 45 years after the disaster, the archive is allowing the publication of 16 historic documents relating to the submarine’s disappearance and the subsequent search operation. This includes Foreign Ministry cables and the minutes of cabinet meetings beginning on January 26, 1968 − one day after communication was lost with the submarine, which was on a training mission on its way to Haifa. Even after all these years, there still remain some classified documents that cannot be published in full. These include the classified 87-page report handed over to Dayan by then-navy commander Maj. Gen. Shlomo Harel on March 1, 1968. That report is on track to be published in its entirety in five years. In the meantime, the State Archives and Israel Defense Forces archives department have cooperated to publish the main findings now. In 45 years, there has been no confirmation that the Soviets were involved in sinking the submarine. The complete report − of which only a few, secret copies were distributed − is currently stored in the IDF’s archives department. It has not been made available to the public because 50 years have not yet passed since it was drafted. Other documents released by the State Archives reveal Turkey’s refusal to allow Israel to scour its coastline to search for remnants of the submarine. On February 2, 1968, Daniel Laor, Israel’s diplomatic representative in Ankara, reported that Israel’s military attache had asked the Turkish chief of staff to allow Israel Navy ships and planes to search along part of Turkey’s southern coastline. The Turks refused, but agreed to conduct their own search operation with Israel’s guidance. “I expressed disappointment that they raised difficulties,” Laor wrote. In another cable sent to the Foreign Ministry, Laor offered several explanations for why the Turks refused to allow Israel to search for the submarine. The first was security-related: “It is a sensitive area between Cyprus and Turkey where air, sea and ground forces were gathering prior to an invasion of Cyprus. Turkey is not interested in having foreign ships searching its waters without its supervision,” he wrote. Cyprus was invaded in 1974, six years later. Laor noted another possible reason: “Turkish pride, based on the pretense that they could do it better than us.” Eventually, however, Turkey helped facilitate Israel’s extensive search operation. Last week marked the 45th anniversary since then-Defense Minister Moshe Dayan proclaimed that the Dakar and its crew were “missing.” A memorial now stands in the Mount Herzl military cemetery for the Dakar’s 69 crew members who perished. This entry was posted in The world's submarines, Video Clip and tagged 1968, Dakar, Israel, Video Clip on March 11, 2013 by jasonlockley.